12mm rectangles, 12mm ovals, 12mm triangles, 10mm coin-shaped, plus some 14mm ovals. A mixture of colors, most with picasso coatings around the edge. ALL BEADS IN THIS MIX ARE DEFECTIVE. Most beads, perhaps 90%, are defective only on one side. Here are some of the defects you will find: partially polished sides or 'windows', cracks, spots of picasso coating on the windows, chips, scratches, large pits, malformed corners. Some of them have only minor defects and look almost perfect, but I nonetheless found them unacceptable to sell at full price. IMPORTANT: The mix of colors has changed considerably since I took the photograph. Note: Not long ago I raised the price from $3.40 to $3.80 per lot, and then to $4.00. 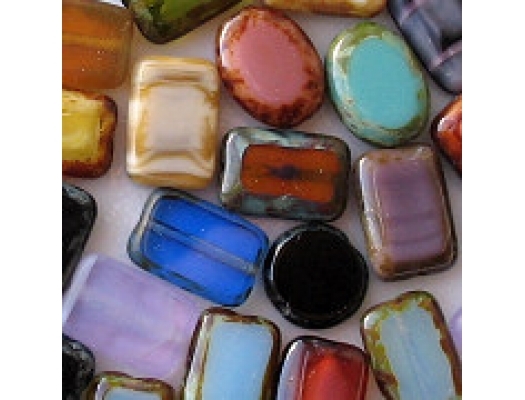 As the wholesale cost of the polished beads go up, the cost of the defective beads goes up also. However, these defective beads still cost less than half of what the perfect beads cost. I used to give away the polished beads that were defective, but then my supplier stopped giving me credit for them, so I decided that I had to sell them. I have set the price at less than 1/2 the normal price for these beads. 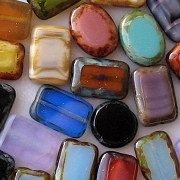 These beads are for (1) designers who are not overly concerned about defects, (2) designers who can find a way to use the beads so that only the good side shows, (3) designers who are using the beads for something other than jewelry, such as beaded curtains, and (4) artists who are making mosaics. You will get a mixture of colors and sizes. And as I say above, 90% of them will have one side which is perfect. 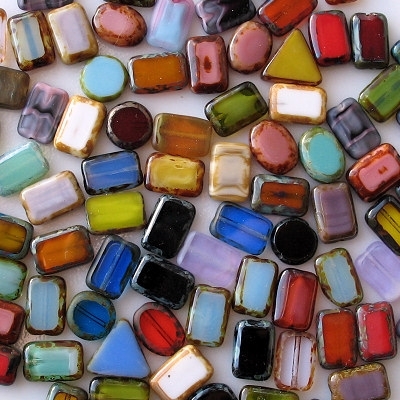 I always select the beads in pairs so that you can make earrings out of them. The beads may be somewhat dusty, and may need washing or buffing.